What does leadership mean to Mendy? Getting involved! She says, "You don’t have to be an expert. Input of fresh, new ideas and helping hands are welcome in organizations," and she should know! Currently, she invests most of her time in support of the Race for the Cure Committee (her mother is a breast cancer survivor) and VIPS – the parent organization for Morriss Elementary (her son’s school.) She is also involved in many community events for work through Texarkana Emergency Center. She says "We participate in the CASA Color Run, Dine on the Line, Alzheimer’s Alliance Twice as Nice Wine Festival, Dragon Boat Race, Mistletoe Fair, Fan Fest, Race for the Cure and Kids Glow Run, First Responder Appreciation Day and Jeans & Bling to name a few". On her experience in Leadership Texarkana: "I learned what an immense number of opportunities for service there are in our great community. There are so many people interested in improving Texarkana USA. Anyone can find their niche – whether it is developing downtown, expanding the arts, serving seniors or the homeless, beautification, developing a healthy community through trails and parks, healthcare, or educational development. The list is endless and there is ALWAYS a need for passionate people who want to make a difference. "There are many, many organizations in Texarkana doing exceptional work. Often, there are multiple organization trying to accomplish the same goals and serve the same population. If we could coordinate our efforts among those organizations – whether it be caring for the homeless or educational advancement for future economic development - imagine the possibilities! Progress in any given area would be immense." 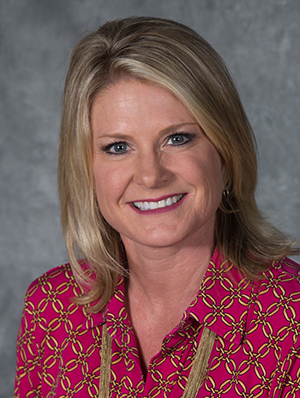 Born and raised in Southwest Oklahoma, Mendy received her Bachelor in Business Administration from Cameron University in Lawton, OK. In 1999, Mendy and her husband, Stacy, relocated to Texarkana where Mendy has worked in the healthcare industry: pharmaceuticals, chiropractic and now emergency medicine with Texarkana Emergency Center. What does Mendy most love about Texarkana, in general? "The sense of community. We have lived here 18 years. I can go anywhere in town and greet someone I know. People here are genuine and are willing to invest in each other. What a great place to live and raise a family. We love Texarkana and have chosen to make it our home for that reason." Personal statement: Mendy plans on continuing to volunteer in the community and serve as leader to help promote and educate those within Texarkana about the great benefits of our amazing city. Being involved in many community events through work and non-profit organizations will allow Mendy to inform, encourage, and recruit potential leaders to get involved and make an impact in our many community service organizations to improve Texarkana USA. If you had one wish and could make a difference of significance in Texarkana (your small corner) what would you do with that one wish and why? That is a challenging question. There are many, many organizations in Texarkana doing exceptional work. Often, there are multiple organization trying to accomplish the same goals and serve the same population. If we could coordinate our efforts among those organizations – whether it be caring for the homeless or educational advancement for future economic development - imagine the possibilities! Progress in any given area would be immense. We are fortunate to live in a community with so many caring people. I would like Texarkana USA to be a community that takes care of its own and is rich with opportunity for new families to want to be a part of our community. What do many people not know about you that you would to share with us? My husband and I are self-proclaimed Parrot Heads. We are Jimmy Buffett fans and love to attend his concerts. 14 and counting so far! What are some of your passions and hobbies? I love spending time with my family, going to the beach, having dinner with close friends, diving, and working in the yard. What do you most love to do in Texarkana? Go to any of our beautiful parks or trails and eat out with good friends. What do you most love about Texarkana, in general? The sense of community. We have lived here 18 years. I can go anywhere in town and greet someone I know. People here are genuine and are willing to invest in each other. What a great place to live and raise a family. We love Texarkana and have chosen to make it our home for that reason. Comments on "PROFILE: Mendy Warner"